Mizen Fine Art is certainly quite ecstatic over the fact that Miyagawa Kosai pieces are going to be shown at the gallery. The exhibition will be held in order to celebrate 18 works that were exclusively sold from June 21-25 of this year. Several of these pieces are indeed quite notable. 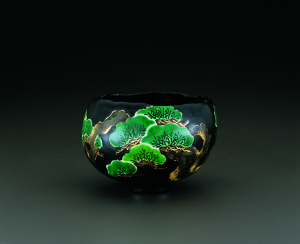 Those who take an interest in fine Japanese yakimono ceramics are certainly invited to attend. Some individuals might end up taking a very serious interest in this event. Keep in mind that this is by necessity a very limited engagement. That means that only certain numbers of people will be able to attend, largely on a first come-first serve basis. Miyagawa-sensei’s works have proven to be extremely popular over the years. An exhibition like this can get quite crowded as a result. The Makuzu exhibition features the art of the Miyagawa Kosai family, largely represented in this class of tea bowl. Kyo-yaki is the best way to describe the style that he works in. It’s also an excellent way to describe the most notable piece being shown at this exhibition. One of them is a magnificent chado bowl designed with the Way of Tea in mind. Japanese tea ceremony specialists always demand the best. This particular piece features a delicate design of an aging pine tree strewn across a black enamel background. Another notable piece got designed originally as a mizusashi, which is a vessel that holds water for the preparation of matcha tea during a tea ceremony. Finished with golden trim illustrating a pattern of a bridge under willow trees, this is a rare example indeed. It’s a piece that’s aesthetically pleasing while still staying fully functional. Some artists create pieces that appear functional, but couldn’t be used in an actual ceremony. Other pieces wouldn’t really hold up to actual water or tea. That’s what places Miyagawa-sensei’s pieces in a class that’s truly all their own. This piece features gold trim along with a willow tree design that adds a small taste of whimsy on top of Miyagawa’s skillful execution. Kyo-yaki certainly has a long history in the world of yakimono ceramic art, but Miyagawa-sensei’s pieces are quite unique. They all have a flavor that’s very different from what most other artists do with the genre. That makes it worthwhile even for those who are quite jaded in the art form to still take a second look at his work. It’s very easy to find something new. Anyone who takes a very serious interest in this exhibition is encouraged to contact the Mizen Fine Art organization in order to receive a full catalogue. This catalogue will feature all pieces that the exhibition has to offer.